If you have ever run into a program you’ve used for years suddenly misbehaving on your computer after an operating system update, it may be time for you get familiar with Windows Compatibility Mode. This tool is readily available within the Windows operating system and can quickly help get your malfunctioning programs working again. Windows 10 Compatibility Mode is an easy to access tool that can help your older programs run on the new operating system. It works by altering certain settings on and program-by-program basis, attempting to allow the old program to function without the potential of hamstringing other programs in the process. The Windows Compatibility Mode tool effectively lets you run programs as if they’re on an earlier version of the Windows operating system. So, if you’re using Windows 10 but need to get a program working again that used to run on Windows 7 just fine, you can tell Windows to run it into Windows 7 compatibility mode. It also has a number of options for colors and resolutions, which can help with some older programs that may not have supported the high resolutions or the extra display colors available now (more on color bit-depth here). 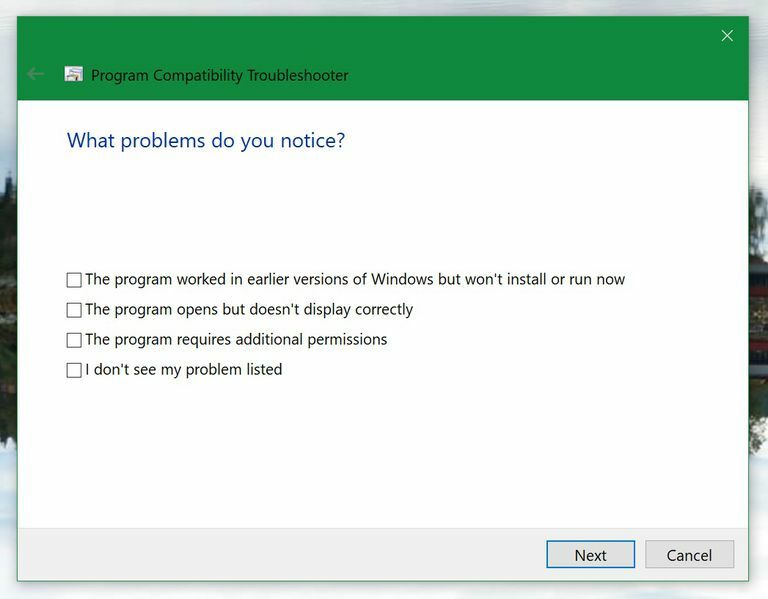 Microsoft has attempted to take a lot of the guesswork out of this process for you by offering a Program Compatibility Troubleshooter. This will automatically attempt to select a Compatibility Mode that will work for your misbehaving program. Right click (or press and hold) on the program icon. Select Troubleshoot compatibility from the drop-down menu. Allow the Program Compatibility Troubleshooter to run. Try running the program using Windows’ recommendedsettings - OR - troubleshoot the program further and select problems you’ve noticed. If the Program Compatibility Troubleshooter didn’t get the job done, you have a good idea of what the issue is, or you know which specific version of Windows the program had previously worked on, you can change the settings of Windows 10 Compatibility Mode manually instead. Select Properties from the drop-down menu. In the Properties menu, select the Compatibility tab (Note: ). If you don’t see this tab, make sure you are selecting a program and not a file. In the Compatibility tab, look for the Compatibility mode box. In the drop-down menu, select the version of Windows that last allowed you to run the program. If you have issues with the visuals/graphics of the program, you can adjust the color and resolution settings in the Settings box of the Compatibility tab. If colors are displayed incorrectly, check the Reduced color mode and select an option in the drop-down menu. Try running the program to see if the error is resolved. If not, repeated Step 8 with a different color mode and try launching the program again. If colors are correct but the visuals look wrong, try checking the box next to Run in 640 x 480 screen resolution. Some programs may require extra privileges to function properly. In this case, you may try checking the box next to Run this program as an administrator to resolve the issues. When Is Windows Compatibility Mode Helpful? If you’re unsure about when you should try to use Windows 10 Compatibility Mode, we’ll help you understand which programs may benefit from it. Generally, you will be using Compatibility Mode with older programs. While many programs get updated to function properly on the latest versions of an operating system, some don’t receive the same upkeep. Even then, some programs designed for an older version of Windows may still operate without issue even with no intervention. Very old programs are the most likely to need to run in Compatibility Mode. If you notice them not working exactly how they are supposed to, displaying incorrectly, or not working at all, then Compatibility Mode is likely the tool for you.